While Growers Supply has extensive experience with commercial and professional growers, the company hasn’t forgotten about the hobby grower. Growers Supply loves the passion and enthusiasm that the hobbyist brings, and there are a number of backyard greenhouse options that can get anybody growing like a pro. Growers Supply has a functional GrowSpan greenhouse solution that also looks great, no matter where it is constructed, and with the highest-quality greenhouses, many professionals have a GrowSpan hobby greenhouse in their backyard. A greenhouse specialist can help any hobby grower get a greenhouse that is ideal for the growing they’re looking to pursue and also for the space that they have. Growers Supply specialists are growing enthusiasts themselves and understand exactly what the hobbyist or backyard grower is looking for, while also keeping budget in mind. Greenhouse specialists can also help customers navigate Growers Supply’s extensive product offerings. As a one-stop greenhouse shop, Growers Supply can help the hobbyist create a growing structure that best suits their needs. When working with Growers Supply, customers will find all the growing products and accessories they need, including benches, growing systems, media, heaters, coolers, fans and much more. There’s no need to wait on that backyard greenhouse any longer. 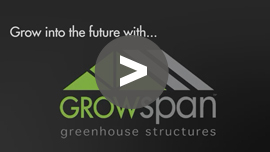 GrowSpan has a hobby greenhouse solution for every grower. Call or visit GrowSpan’s Hobby Greenhouse Page to buy now.